Paul Ryan shut down reports that he'll retire next year, but there are lots of reasons he might be considering it. 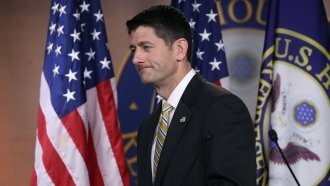 Rumors circulated Thursday that House Speaker Paul Ryan was considering retiring after the 2018 midterm elections. Politico and CNN report the speaker has discussed the issue with close friends and family. But Ryan told reporters that he wasn't going anywhere. Still, there are a couple reasons to think Ryan might want to call it quits. For one thing, the president's party tends to take a hit during midterm elections. Right now a Monmouth University poll suggests in a generic House race, Democrats would beat Republicans by 15 points. And Republican incumbents are retiring at a rapid pace this year — possibly opening a door for Democratic contenders in those districts. All that means Ryan could lose his House majority, or at least see Republican power in the house waning at a time when the GOP has struggled to pass major agenda items through Congress. And Ryan was reluctant to take the speakership job to begin with, partly because he wanted time to spend with his family. CNN reports he's now worried about the toll the job has taken on his family. On top of all of that, most speakers stick around for just over four years, even though there's there's no term limit for the job. Ryan became speaker in 2015.